Raritan 1210 Handle Sockets for Raritan Engineering PHII and PHEII marine toilets are in stock and ready to ship at Boatersland. This handle socket will fit perfectly with both the manual and electric push button toilets manufactured by Raritan. Note that the electric push button model can also be operated manually. 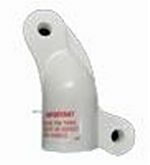 Boatersland has this Raritan handle part at the lowest price on the market and Boatersland is your home for low-cost Raritan repair parts.